The Miami Hurricanes have officially axed Al Golden after four years and seven games. The Hurricanes were a mediocre 32-25 overall and 17-18 in ACC games during the Golden days (sad pun). He also wore a white oxford and a tie to games, which seems uncomfortable in the Miami heat. More on Golden and the Hurricanes later. The World Series begins this week so college football will likely not be your main focus, but I’m here for you anyway. J.T. Barrett finally was named the started and Ohio State rolled 49-7 over Rutgers. 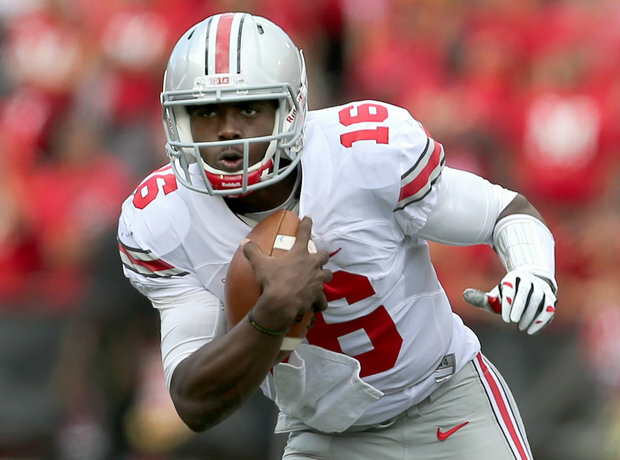 Barrett had five touchdowns and 324 total yards. He looked composed and his maturity allowed the Buckeyes to play a more consistent game. Cardale Jones should have entered the NFL Draft after last season. I’m guessing Jones will be stuck in Columbus, Ohio for at least another year. I can’t imagine him leaving after a lackluster year like this. Barrett might be the spark Ohio State needed. Ezekiel Elliot continued to play while and is probably amidst the quietest Heisman journey in recent memory. Braxton Miller makes plays and the defense looked good. I think the Buckeyes are trending up at a good time. The final two weeks of the season will feature the Michigan State Spartans and road game against the Michigan Wolverines. The Ole Miss Rebels topped Texas A&M 23-3 and I was lucky enough to be in attendance for this one. The game wasn’t especially close and the Rebels looked sharp defensively. C.J. Johnson‘s return and Kyle Allen‘s meltdown were major reasons why the Aggies managed only three points. Tony Bridges, who had shown flashes of potential, was struggling in coverage over the previous few weeks. He really turned things around a played a good game against a good set of receivers. I thought the running game and the return of Laremy Tunsil was a major positive for the Rebels’ offense. The mistakes didn’t prove fatal and a few plays were run at the end of the game that shouldn’t have been. In general, it was a big win for a team in need of one. Chad Kelly threw three interceptions in three totally different ways. The first interception came on a pass that was tipped by Myles Garrett. Garrett, who looks like he was artificially created in a lab, caught the ball and stumbled a few yards before being tackled. Is this interception Kelly’s fault? I’d say this interception is a credit to Myles Garrett and not a reflection on Kelly. The second interception was a bad decision. Kelly, who was under pressure, moved up into the pocket and was close to the line of scrimmage. He would have probably gained a yard or two and he opted to throw the ball instead. This is a bad decision under duress and the ball was picked off. Is this interception Kelly’s fault? Is the Pope Catholic? The final interception was a bad decision by the coaches to throw the ball. A running play would have been more appropriate and Kelly didn’t help things with a poor read. I thought Quincy Adeboyjo might have wrestled the ball away (or it might have been close enough to warrant a simultaneous possession call) initially. It was, however, an interception. Is this interception Kelly’s fault? I would say it’s probably 50% on Kelly and was a mistake made by the coaches. Kelly didn’t have his best game and now is tied for most interceptions thrown in the SEC. He does, however, lead the SEC in almost every passing category (including the key categories like touchdowns, yards, attempts, completions, etc.) and is a major reason why Ole Miss sits at 6-2. Arkansas beat Auburn 54-46 and converted 1,000 (not really) 4th downs to do so. Alabama wins 19-14 over Tennessee, the best 3-4 team in CFB history. Memphis, Temple, and Houston are all undefeated and people are starting to pay attention. Missouri hasn’t scored a touchdown and a very long time. Baylor scored a mere 45 points over the weekend and QB Seth Russell has a neck injury. Georgia Tech upsets the ‘Noles with a huge special teams play, the Block-Six? Duke wins a stunner over Va. Tech and is now 6-1. No team has played any team and every team is better than some team. Washington State deserves to have College Gameday. Dak Prescott is having a monster season in a very quiet way. Christian McCaffrey is an emerging star and will be in the Heisman discussion soon. Who will coach the Miami Hurricanes in 2016? What qualities does the new coach need to possess? Are there changes outside the program that need to occur in order to succeed? I think it all starts with the administration. The Hurricanes don’t have a stadium on or near their campus. The drive to SunLife Stadium is inconvenient. It’s also important to remember that the University of Miami isn’t an especially large school and that 17,000 students aren’t enough to pack the house. Miami would greatly benefit from a smaller stadium near campus. The stadium could seat around 50,000 fans and it would be sufficient. The Hurricanes have averaged between 46,000 and 53,000 people at games since moving to SunLife Stadium. The foremost quality the new Miami coach will need to possesses is perseverance. He’ll need to be energetic enough to infuse life into a program that hasn’t had much success lately. He has to win in a different manner than the Hurricanes have done in the past. The program’s image is changing and the administration is making sure of that. The new coach will need to repair the relationship between the university and its former players. He must keep local talent in the program. The fans have plenty of other entertainment options in Miami, so he’s got to win early and create excitement. My list doesn’t comprise any big names or hot commodities. I don’t think Miami is a realistic destination for some of the hotter names in coaching right now. Tom Herman (Houston Cougars), Justin Fuente (Memphis Tigers), and Matt Rhule (Temple Owls) will likely all have a more appealing offer than Miami. Rhule isn’t going to go there after Golden, also from Temple, just got fired. Herman will likely be a candidate for a better job due to his success this season and last year with Ohio State. Fuente isn’t a cultural fit and is likely a prime target for South Carolina. Miami is a tough job to sell right now and if they want a bigger name than those that I’ve mentioned below, they’ve got to take a leap of faith. Alabama’s Kirby Smart would be a big risk. He’s been Alabama’s defensive coordinator since 2008 and has the most talented roster in all of football to work with. It is unclear what degree of responsibility should be assigned to Smart. Does Smart deserve praise when things go well (often give to Nick Saban) or criticism when things go poorly (often given to Lane Kiffin)? I can’t see Smart and Miami meshing very well. I don’t think they’ll hire a coordinator anyway. Positives: He is a former defensive coordinator and is a tough guy. He enjoyed success at Rutgers and coached in the NFL. He’s familiar with the program and understands the steps one must go to succeed there. Negatives: He has the personality of an engaged bison. He is gruff and isn’t especially good at fundraising. This is a problem at a small, private school. He’s been out of coaching for a few years and isn’t going to be a splash hire. He has never smiled. Positives: The fans love him and want him back. He was successful at rebuilding the program once before and was 51-20 from 1995-2000. He built the greatest college football team of all-time, the 2001 Miami Hurricanes. He was also a part of the Jimmy Johnson-era in the 1980’s. Negatives: Davis is older and has been out of coaching for a while. He was the head coach at North Carolina during a time of sanctions and misconduct. He resurrected the program in 1995 when the college football landscape was very different. He’s a sentimental pick for many fans and there is no guarantee he is still the coach he used to be 20 years ago. Positives: He’s young and knows the landscape. He’s former player and recruits well. He’s on staff at Alabama which might lead you to believe he’s going to be able to carry that over to another job. He’s a likely choice to be a finalist for the job. Negatives: Cristobal’s record as a head coach, no matter the situation, is still relatively unimpressive. He’s a positions coach right now. People will want to hype up that Cristobal won a “National Recruiter of the Year” award. That award, which sounds slightly like a joke, means nothing. He won the award recruiting at Alabama and using resources that he won’t have at Miami. Miami hiring him would be way too obvious. Positives: He’s an offensive mind who adapts to his roster. The decision to move West Virginia into the Big 12 has created a lot of impediments to his success and a move to Miami would allow him to have a more talented roster. He could work wonders with Brad Kaaya and the current roster. Negatives: The move to Miami might be a lateral move. The fan support and stadium atmosphere at West Virginia is much better to what Miami can offer. Holgorsen’s record isn’t spectacular and that won’t change with a mediocre 3-3 start this year. Positives: He went 67-27 at Nebraska. He’s a tough guy and Miami needs leadership. He’s like a much better Greg Schiano. He would instill discipline and advance the administration’s goals of cleaning up the Miami image. Negatives: He is rough around the edges. He’s likely going to struggle to find a cultural fit amongst Miami alums and boosters. He has no ties to Florida.